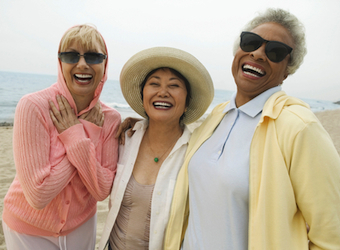 Are marketers putting Baby Boomers in the corner? According to a new national survey conducted by Blaze, of more than 1,000 Baby Boomers, marketers are failing to understand and effectively engage with this section of society, running the risk of missing out on their sizeable disposable incomes. generation when developing new products and services. are opening up with more freedom, time, dreams and money,” says Sara Garcia, principal of Blaze. “50 year olds are not the same as 80 year olds, any more than 20 year olds are the same as 50 year olds. The industry must recognise and engage this age group, embracing the creative and financial opportunity they represent,” she says. with this Australian Boomer consumer. online peer group reviews as well as word of mouth. 94% of respondents think that media and advertising should recognise that ‘my age group is still interested in buying new things’. 72% are open to trying new brands. 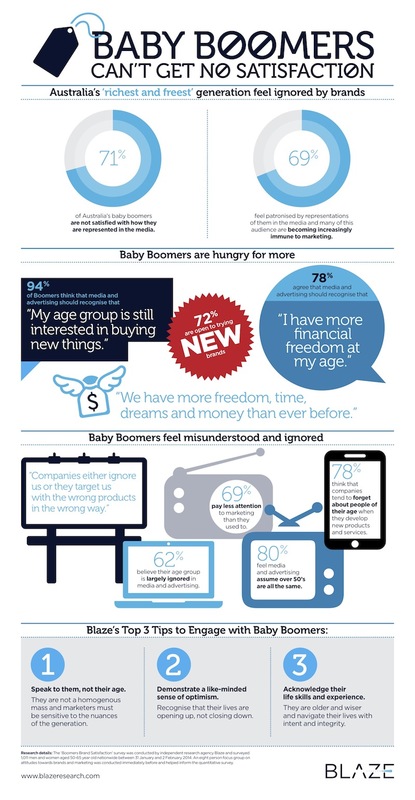 78% agree that media and advertising should recognise that ‘I have more financial freedom at my age’. 71% are not satisfied with how they are represented in the media. 80% feel media and advertising assume over 50’s are all the same. 69% feel patronised by representations of them in media. 78% think that companies tend to forget about people of their age when they develop new products and services. 62% believe their age group is largely ignored in media and advertising. 69% pay less attention to marketing than they used to.